Full Auto Films and Code 3 Films have teamed up to bring horror fans MASSACRE ON AISLE 12. Having its world premiere in November, the film’s first teaser shows several employees fighting over a bag of stolen loot. 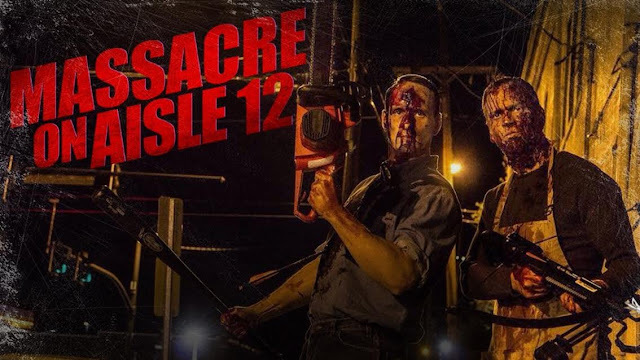 MASSACRE ON AISLE 12 was directed by Jim Klock and William Mark McCullough (Patient Seven). As well, the script was developed by Jim Klock, from the original script written by A.J. Via and Chad Ridgely. All of the upcoming release details for the film and the teaser are available below. The bloodshed begins on Christmas Eve. As a hardware store begins to close, a duffel bag of cash is found, but so is a body. Now, the employees must decide what to do with both items. Should they turn the cash in, or go on a Christmas shopping spree? Events take an even bloodier turn when the employees turn on each other. Horror fans can watch several characters implode in the face of so much cash in the teaser below.